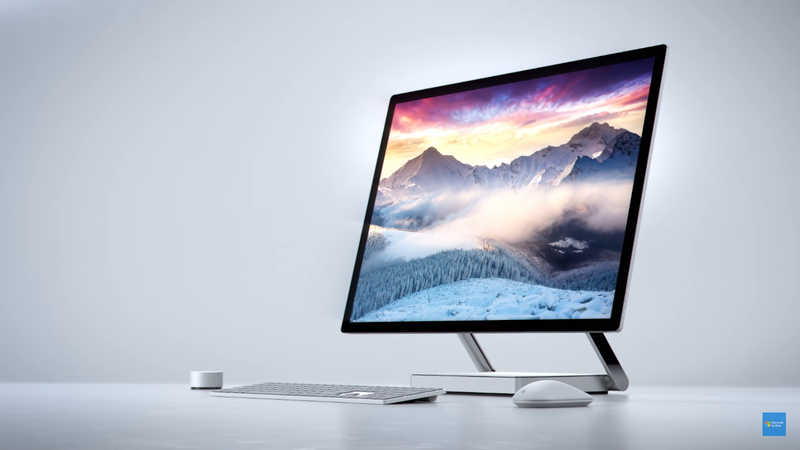 Microsoft has officially announced the extension of the surface family by introducing the new Microsoft Surface Studio. This will be the first desktop device by the company. At the event on Wednesday at New York, the company also unveiled that the desktop will be a touchscreen device and claims that it will be the world’s thinnest LCD monitor thickness of 12.5 mm. The major remarkable feature of the device is that the whole screen can smoothly tilt down on a four-point hinge experiencing a touchscreen tablet PC. However, the screen doesn’t tilt completely to the ground but stays at the 20 degrees angle. This is the best angle for easy swiping and drawing on the screen. The pricing of the surface studio starts at $2,999 and also comes at prices of $3,499 and $4,199 depending on the hardware and will be available in limited quantities. You will get a Surface Pen along with the Surface Studio. You will get a Surface Pen along with the Surface Studio. There is a new device called Surface Dial which looks like a jog wheel. The Dial works by placing it on the screen which brings a context-aware menu. For instance, while drawing it will bring multiple color options as a wheel. Microsoft’s colossal focus is on the 3D. It has brought a new 3D update to the Paint App and is therefore named as Paint 3D.